For centuries, glaciers have inspired awe and wonder. The idea that human assault might ever triumph over such powerful features of our natural landscape seemed almost unimaginable. But now climate change is disrupting the ecological balance of the Tibetan Plateau and the mighty glaciers of the Himalaya are, in fact, disappearing. 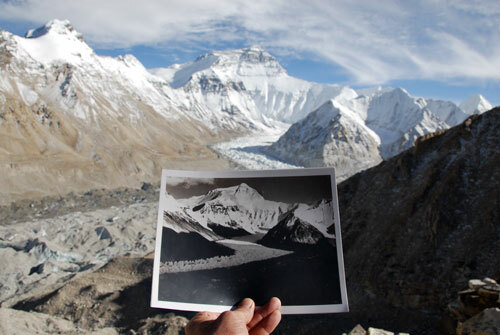 Rivers of Ice: Vanishing Glaciers of the Greater Himalaya showcases the work of photographer and mountaineer David Breashears, who with Glacier Research Imaging Project (GRIP), has retraced the steps of renowned mountain photographers of the past century to recapture images of these mountains and their glaciers from exactly the same vantage points. Rivers of Ice displays his recent photographs alongside the corresponding historic images, revealing the alarming loss in ice mass that has taken place over the intervening years. The snow and ice stored within the magnificent arc of high-altitude glaciers in the Greater Himalaya are crucial sources of seasonal water for almost every major river system of Asia, from the Indus in the west to the Yellow in the east, with the Ganges, Brahmaputra, Irrawaddy, Salween, Mekong, and Yangtze Rivers between. If current melt rates continue, these glaciers will be unable to maintain mass balance, ultimately disrupting the water supply to hundreds of millions of people downstream. GRIP is using the power of images to raise public awareness and shape policy focused on mitigation and adaption to the climate crisis.